NASA willannounce on Tuesday the name it has chosen for a new space station module withhelp from comedian Stephen Colbert, who has campaigned for weeks to have itnamed for him. The U.S.space agency said today that it will reveal theofficial name of Node 3 — a new room for the International Space Station — onComedy Central's ?The Colbert Report.? ?Theprogram is having us on knowing that we have chosen a name, but they do notknow the name of the node,? NASA spokesperson John Yembrick told SPACE.comfrom the agency?s headquarters in Washington, D.C. ?To be honest, only ahandful of people know at this point.? The namewas chosen a few days ago and will be revealed by NASA astronaut SunitaWilliams, who livedaboard the space station for nearly seven months between 2006 and 2007,Yembrick said. "Icertainly hope NASA does the right thing," said Colbert. "Justkidding, I hope they name it after me." Node 3 is acylindrical room slated to be delivered to the space station in February 2010aboard a NASA space shuttle. It will serve as the hub for much of the spacestation?s life support systems and include eight equipment racks, each the sizeof a kitchen refrigerator. 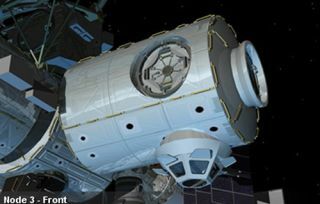 The node will also house one of the space station?sbathrooms and an observation portal that will serve as its robotic armworkstation. Colberthas been pressing NASA to name Node 3 after him after winning the spacestation?s recent online poll to choose its new moniker. He urged fansto vote for his name as a write-in candidate and ended up with morethan 230,000 votes, outdistancing the top NASA-chosen candidate ?Serenity?by 40,000 ballots. Even members of Congress rallied to his cause. The onlinepoll closed on March 20. Yembricksaid that such an outpouring of support from Colbert?s fans made unveiling Node3?s name on the comedian?s cable television show a natural choice. ?Hisaudience took an interest ?and we want to honor them for caring,? Yembricksaid. The agency initially planned to unveil the name on April 28, when themodule was due to arrive at NASA?s Kennedy Space Center in Florida. But thedelivery has been delayed to May, so NASA opted to move the announcement up,agency officials said. NASA?srules for the poll clearly state that the voting results would not be binding,but some sources have suggested that the outpouring of support by Colbert?sfans may prompt the agency to nameNode 3?s space toilet in honor of the comedian. "The node naming poll was organic and took on a life ofits own," said NASA?s space operations chief William Gerstenmaier, who wasgrilled by Colbert on Node 3?s name when the official appeared on the show lastmonth. "We received more than a million entries, in large part becausesocial media Web sites and television programs, such as 'The Colbert Report,'took an interest. This spread overall awareness of the International SpaceStation.? NASA will unveil the new name for Node 3 on the April 14episode of the ?The Colbert Report,? which will air on Comedy Central at 11:30p.m. EDT. Check local listings.